This blog follows my current research project which has been generously supported by an a-n Artist Bursary 2018. The commercial weavers Dash & Miller have invited me to spend a period of time learning about the different looms that they use in their mill in Bristol. I employ fibre, textiles and mixed media in my work and trained in Tapestry, in the school of Drawing and Painting, at Edinburgh College of Art. My grandfather operated one of the early computers at Walthamstow Town Hall for the company International Computers Limited and I have inherited some of the punch cards from that machine. In my twenties I found out that some of my ancestors on my grandfather’s side of the family were French Huguenot silk weavers and trimmings manufacturers, living and working in Spitalfields in the 1700s. 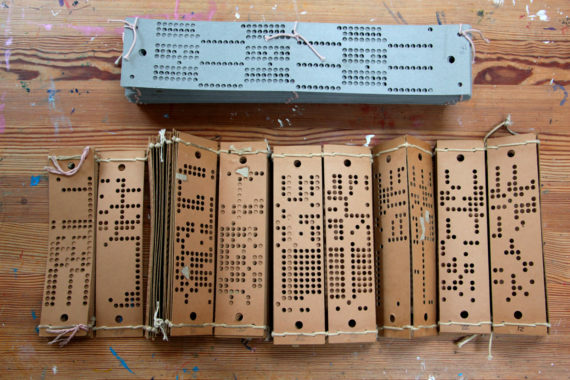 My aim is to explore and understand more about the punch card system used in both weaving processes and in the first computers. 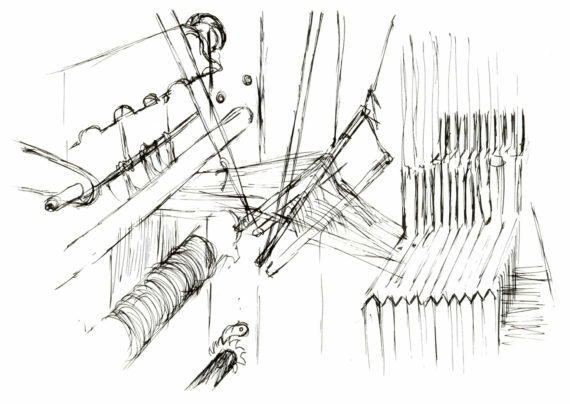 Through the summer and winter of 2018 I will make ten research trips to visit Dash & Miller and the Bristol Weaving Mill in order to observe, document and learn about loom technology first hand. Looking at the genesis, history, and technology behind the pixelated image – the Jacquard loom mechanism that inspired modern computing. The weavers that I have met through this research know how to collaborate and best support each other at each stage of the making process. 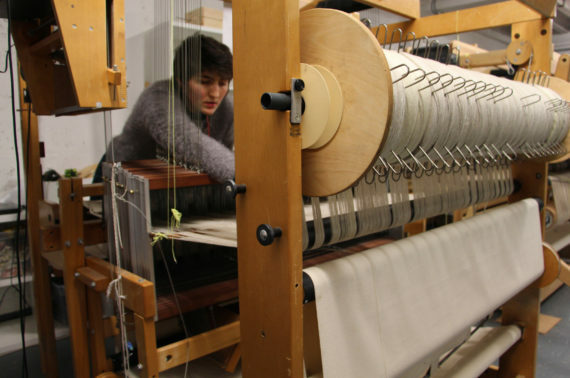 Prior to completing my research in Bristol, Juliet from Dash & Miller suggested that I contact Lindsey Waterton Taylor in the School of Design at the University of Leeds, in order to find out more about the latest developments in weaving technology. 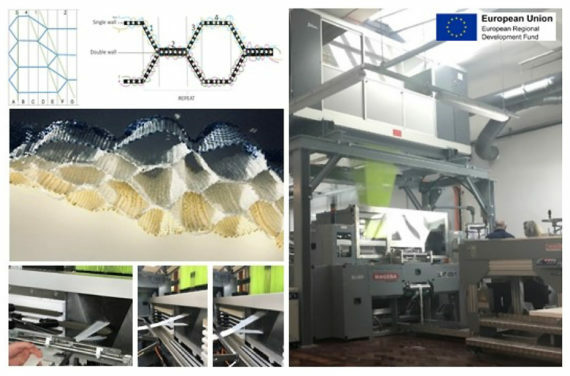 Lindsey has recently set up a state of the art multi-shuttle Jacquard weaving loom on campus at the 3D Weaving Innovation Centre (3D WIC) with funding from the EU. Thanks to Juliet’s introduction, I was able to plan a trip to Leeds to meet with Lindsey and observe the loom in action. 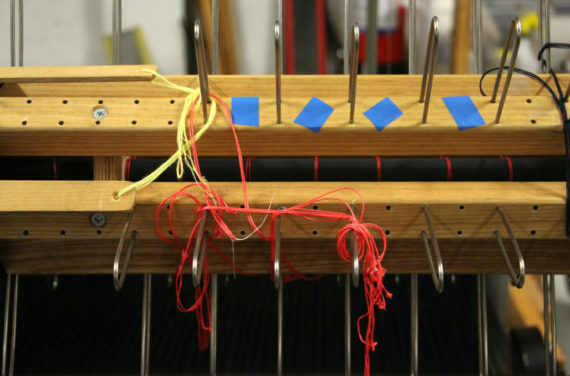 The Jacquard looms at Dash & Miller in Bristol, and at the University of Leeds, have individual heddles/harness cords which are digitally operated. 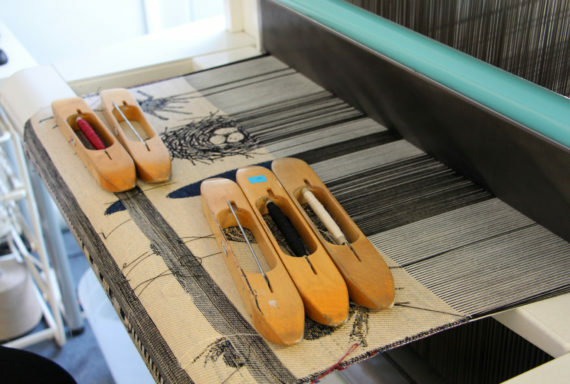 The Jacquard over the multi-shuttle weaving technology has a motor for each heddle-harness cord. This means that the ends can be lifted one at a time, rather than grouped in sequence on shafts, as one sees in the workings of a hand loom. This enables the weaver to achieve all kinds of weave structures, with designs constructed using divergent patterns and highly complex imagery. At the 3D WIC, Lindsey is working at the cutting edge, exploring the potential of this multi-shuttle Jacquard weaving technology (loom) in the production of near-net-shaped preforms, 2D-3D woven structures for end applications including: fashion, architecture and civil engineering. At the end of January, I spent the afternoon with Lindsey and her team, looking at the range of 3D prototypes they had developed. We spoke in detail about the potential of the specialist equipment and Lindsey’s hopes for the future of the department. I was struck once more by the intellectual prowess of the weavers that I met, each bright-eyed and quick thinking. As we chatted, it was great to find common ground so easily. We all share a curiosity about form, technique and material qualities. Watching the looms over the last few months, in Bristol and in Leeds, has left an indelible imprint on my mind. Whenever I have handled, worn, or worked with woven cloth, I have found it miraculous in its structure and invention – whether plain silk satin, or gaudy 50’s metallic brocade. Through this research some of the mystery has been solved, but there is still so much for me to explore. I am now even more aware of how much experience and human energy is held within each of the fabrics that I have in my possession at home, and at my disposal as an artist. From speaking to the weavers as they work, and from direct observation of the looms in action, I am beginning to comprehend the methods and mechanisms used to create patterns and different structures in woven cloth. Before Joseph Marie Jacquard invented the punch card system in 1804, the ‘draw-boy’ would perform the task of lifting the threads in order atop of the loom for each stage of the weaving process, while the weaver passed the shuttle back and forth at the front. Jacquard’s invention of the punch card mechanism automated the design of the weave on the loom. Diverse, interlaced thread structures can be realised by changing the instructions on the punch card. First a peg plan is made and then this information is transposed onto a punch card. Zoe from The Bristol Weaving Mill kindly gave me some punch cards from her college days, such lovely objects in their own right, made from dense card and laced together with pastel coloured threads. She told me that any notation shown in black on a threading or peg plan is ‘active’ and so is an instruction to lift a shaft. 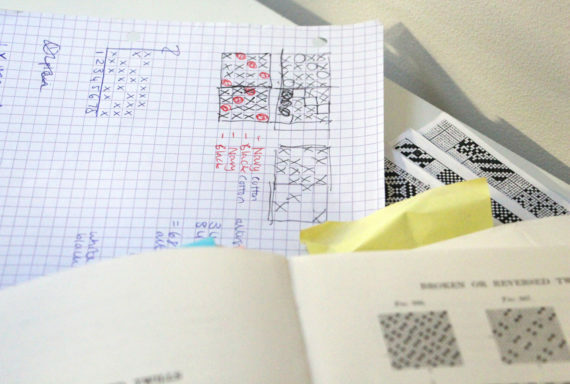 Throughout the design studio and the mill there are notebooks, print outs, reference books and computer screens with checkerboard like data containing countless weave structures. The warp threads that pass from the front to the back of the loom are called ends. 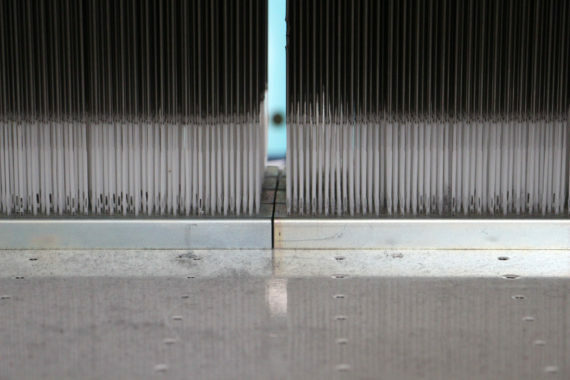 The weft threads which the shuttle passes from side to side are called picks. 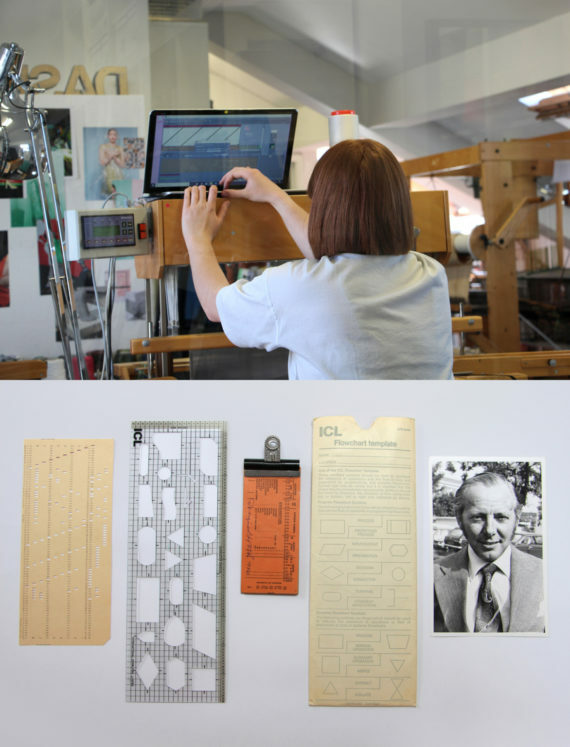 There is digital software that feeds the equivalent punch card instruction to the majority of the hand looms and the Jacquard loom at Dash & Miller. 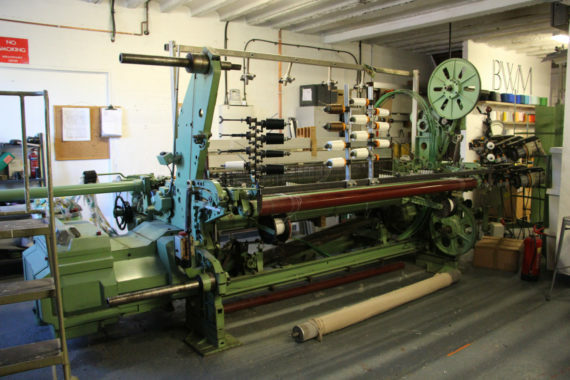 While at The Bristol Weaving Mill downstairs, there is a large industrial loom which works off plastic punch cards. From a prepared print out of the peg plan, the weavers punch the data into acetate sheets by hand, line by line, on a punch-card machine. 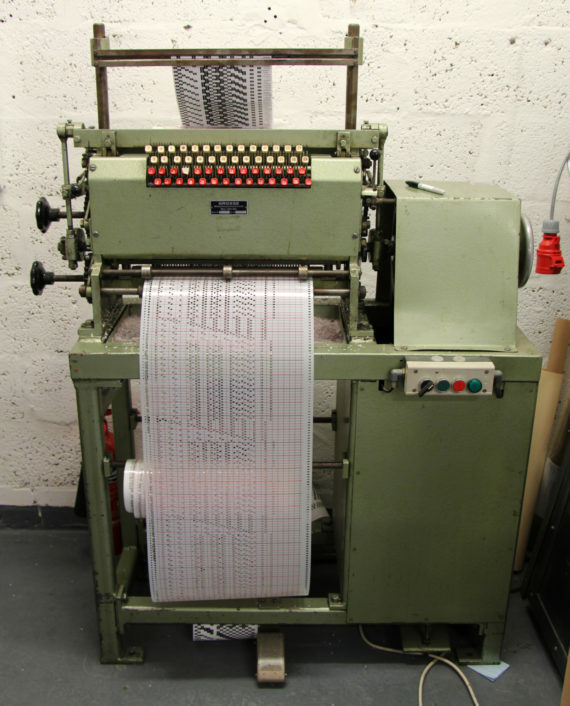 The machine resembles a typewriter and there is a choice of up to 28 numbers to punch per line. 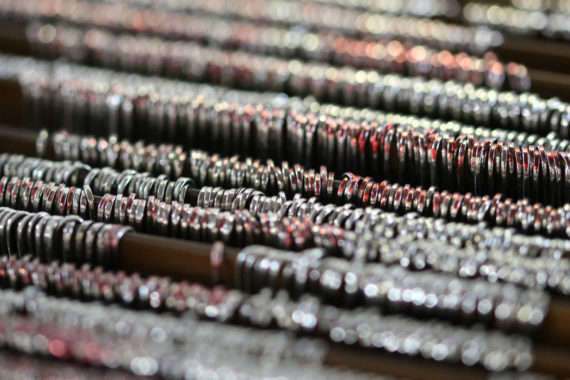 Depending on the complexity of the weave and whether it alters as part of the design, the punch cards can vary significantly in length, from short tubes to very long looped sheets. When the punch card has been cross checked for errors and corrected, it can then be read by the loom. A metal plate called a dobby head on one side of the rapier weaving loom has a row of raised pins. By this mechanism, the card is read, one line at a time. If a hole is found, the corresponding shaft is lifted. This creates the ‘shed’, the space between the threads for the rapier (in place of the shuttle on a hand loom) to pass through. 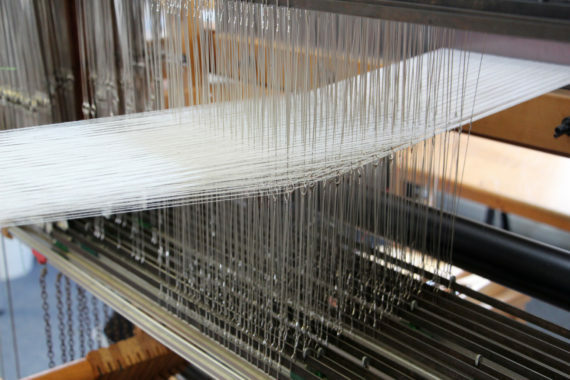 In some instances, different threads are used in combination for the warp setup. If two materials are used, such as linen and cotton, these may be affected by temperature and humidity. This can cause problems with the tension of the warps, or can mean that one material weaves better or worse during the summer or winter. Changes in the atmosphere can mean that the warp ends may need to be tightened or adjusted as time goes on, otherwise the yarn may have a tendency to break. Sometimes the yarn is sprayed with water to prevent it from becoming brittle. Dressmaking pins are always to hand, and are used to tie on new warps when they have snapped under tension or friction. Upstairs at Dash & Miller it is fascinating to observe the sensibilities of individual weavers coming through in their samples. I ask the women if they have a clear vision of what each fabric will look like once it’s woven and they each have a different way to describe what they see in their minds eye. Their depth of experience and the pace of making means that there is an intuitive vibrancy to the work produced. Once a piece is completed, the fabric is cut off, washed, dried and then trimmed. Certain fabrics are finished on a heat press, some may be brushed or whole areas of threads may be snipped to create a tufted or distressed surface. I sit at one of the Dobby hand looms and am surprised when the seat rocks backwards and forwards as my feet move on the treadles. On a wide loom the shuttle is not so easy to pass through the shed in one go, but it is wonderful feeling to be a part of the machine. I only wish that I too could be an expert, like all of the women here. My first visits to to see Juliet Bailey, Franki Brewer and the team at Dash & Miller and the Bristol Weaving Mill have been an eye opener. I have drifted around watching the women work on different projects simultaneously, juggling tasks as they work to meet weekly deadlines. I’m not really sure how they are doing it all. There is talk of trips abroad and samples from the previous week being sent off to international clients. I am trying not to get in the way too much and have lots of questions, which everyone is kind enough to find the time to answer. I admire their expertise. All the weavers, including the young apprentices, are highly skilled and take everything in their stride, despite the heat wave. The Bristol Weaving Mill is downstairs from the design studio of Dash & Miller and run by a different team, but everyone moves from space to space, having helpful conversations about the work, offering opinions and their hands as and when they are needed. It is a beautiful experience being here and seeing all of this creativity and collaboration. What strikes me is that there is a lot of fine metal in the looms and the juxtaposition of this hard material next to the threads is visually exciting. Coloured stickers, tape, wood, paper, newsprint, string, rope, metal rods and canvas all play a part and appear to embellish the machinery of the looms. I presume that each element has an essential function either as a temporary sign, support, or to provide tension. All around me I can see threads in different stages of the weaving process: taught, knotted, cut, recoiled, attached, weighted. As she works on the Jacquard loom, Juliet tells me that people weave at different tensions depending on their natural strength and technique, that this is an important consideration when they take over from one another. There is a calm atmosphere, everyone is chatty and friendly, yet there is a huge amount of work being done every day, intellectually, creatively and physically. Nothing can be rushed, no stages can be missed out or done carelessly. There is a methodical and contained process at work. Experimentation is evident in the breadth of the textiles being produced. This is all kept under wraps to protect the confidentiality of clients, designers, artists and collaborators. I ‘ooh’ and ‘ahh’ at the exquisite textiles as they expand on the looms in the course of an afternoon. I witness the creation of eloquent, subtle weaves in natural fibres and then fizzing, textural fabrics woven in unexpected combinations of yarns and man-made materials. Through making by hand I explore the visual and emotive potential of materials. I enjoy experimenting with different media, predominantly fibre based: silk, cotton, velvet, wool and paper. Each have the potential to be transformed using domestic equipment and tools: a sewing machine, scissors, pliers, a needle. My work often blurs the boundaries between two and three dimensional forms of art; some pieces are painted or stained, like canvases in relief.